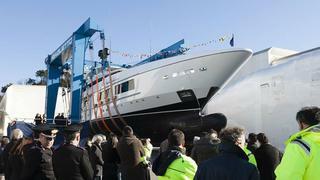 Project 10219 has been launched at Baglietto's shipyard in La Spezia, Italy. 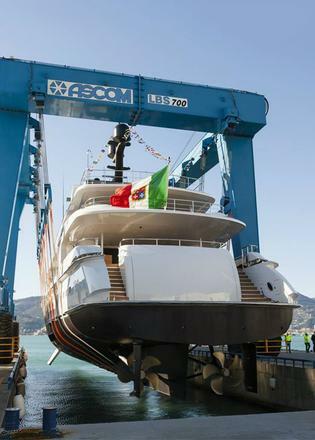 The new 54 metre superyacht was pictured being lifted into the water in the presence of its European owner and employees from the shipyard. Superyacht designer Francesco Paszkowski, a regular Baglietto collaborator, designed the steel and aluminium displacement superyacht. 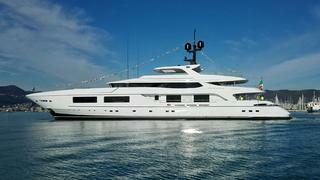 Project 10219 is inspired by previous Baglietto 53 metre yachts, such as Gitana (now Blanca) and Baraka (now Burkut). Yet the 54 metre has been updated with the new Baglietto styling by Paszkowski, which combines geometric shapes with sleek exterior lines and a streamlined bow. This new styling was first explored by Baglietto and Paszkowski in 2013 with the introduction of the 44 metre Fastline superyacht Monokini. It has now been adapted to create the lines for Project 10219. For the interior Paszkowski collaborated with designer Margherita Casprini to create expanded interior volumes that provide accommodation for 10 guests in four lower deck guest cabins and a large main deck owners suite. The main deck also features interior dining and a saloon for relaxing. The bridge deck sky lounge leads out to a covered exterior dining area and there is also a large open plan sun deck. Twin Caterpillar 3516B engines will power Project 10219 metre to a projected top speed of 17 knots and a cruising speed of 13 knots. The yacht has capacity for 11 crew. 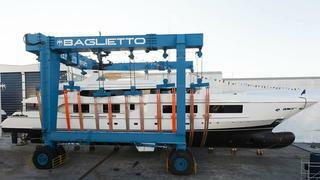 The Italian superyacht builder announced the order for the yacht in 2014 as it celebrated its 160th anniversary.